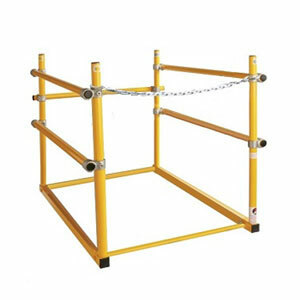 OSHA Compliant Roof Hatch Safety Guard Rail System for 30 x 96 inch size (inside opening size). Bolt-On Design. Fits side-ladder, Rear-Hinge hatch design. Yellow powder coat finish. Price/Each. (aka HR3096, SHWC-3096). Leadtime 3 business days. Truck shipment required. Use UPS Freight in checkout or email us for shipping quote.